We played this scenario most recently at the Durham Wargames group show a couple of years ago but have played similar scenarios several times over the years. It can go either way – though the British player has a somewhat harder task. Perspicacious reader will gather that it bears more than a passing resemblance to the Battle of Fontenoy in the War of Austrian Succession. Models used were all from my own 18th century collection. The vast majority being Old Glory,of course, from our various 18th century ranges. 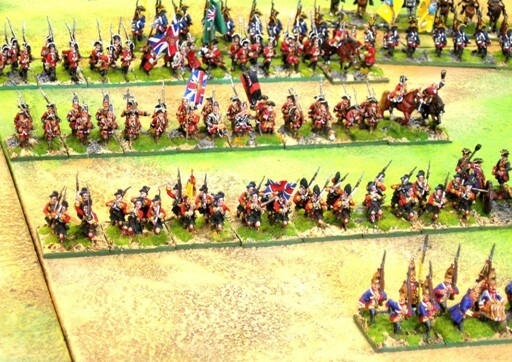 Nowadays you could also get the vast majority of the troop type from the Blue Moon 15mm ranges. We played the game with 4 players (2 per side) and an Umpire. The terrain was largely flat but with a fortified village on the French Right and a redoubt on the left – covered by woods. MV stands for Morale value Figure Ratio for the actual numbers is 1-20. Awful jokes are all my own work!!! Sir, the enemy is before you. They bar your progress to Tournai. They have fortified the village of Nontenoy and have built redoubts to bar your way. Behind their first line you can see other troops (off table). Including the less than reliable Dutch and the paid Hessians you slightly outnumber the enemy forces. Your cavalry is superior in numbers. Your strength is in the British Infantry. You should attempt to break through the French lines and destroy the enemy as a prelude to the relief of Tournai. The Free companies should be deployed close to the Bois de Pisse. Battalion guns must be attached to a specific battalion within their brigade. Otherwise troops may deploy up to 18” from the baseline. The Dutch and Hessians – other than the Free Companies must deploy opposite Nontenoy. Once deployed artillery – other than battalion guns may only move at manhandled speed of 2” per move and may not fire when moving. Infantry Brigades should be kept together or dire punishment may befall (‘ware the umpire). Cavalry squadrons should be kept together in the same way but there is a little more leeway here. His Britannic Majesty’s Army in Flanders. 1st Royal Dragoons 3 sqns. mv2 24figs 480 men. Cobhams Dragoons 2 sqns. mv2 20 figs 400 men. 13th Kerrs Dragoons 1 sqn.6 figs mv2 120 men. Troop Horse Grenadier Guards. Mv 3, 3 figs 60 men. 1st Foot (Royals) St Clair mv3 28 figs 560 men. 3rd Foot (Buffs) Howard’s mv3 24figs 480men. 17th Foot Forbes mv3 32 figs 640 men. 34th Foot Cholmondley's mv3 32 figs 640 men. 1 light battalion gun to be attached to a designated battalion. 36th Foot Fleming’s mv3 32 figs 640men. 50th Foot Hodgson’s mv3 28figs 560men. To General Hertz Van Rentals by order of the States General of the United Provinces. Greetings. You should co-operate with the Duke of Cumberland but it is imperative that casualties in your forces should be kept to a minimum. Especially amongst the Dutch National troops. Your forces should remain together and should not be allowed to be broken up from their Brigades. Forces of the United Provinces and the Landgrave of Hesse. Commander General Hertz van Rentals. Garde Dragonder1 sqn 8 figs mv2 160men. Hussars 1 troop. 4 figs mv2 80men. Gardes te Voet 24 figs mv2 480 men. Commander FMH Claus von Konigsegegegeg.+1. Infantry Regt “Von Donop” 48 figs mv2 960 men. Infantry regt “von Konigsegegegeg” 24figs mv2 480men. Fusilier regt “Von Schorthausen” 22 figs mv2 440men. Combined Grenadier battalion 14figs mv3 280men. Free Companies 12 figs mv1 240 men. The motions of the Pragmatic army under command of the Duke of Cumberland look to threaten our siege of Tournai. The Irish brigade begin the game off table. The French cavalry may begin off table at your discretion. Guns must be placed in the village and in the redoubt- at least 1 in each place. Once positioned the siege gun may not move but may turn in place- this counting as moving for fire deductions. The Grassins must begin in the Bois des Pisse. Both the village and the redoubt must be held by a minimum of 1 battalion each. The French Defend NontenoyCorpese by Front Rank Grenadiers de France Elite. All other troops Old Glory or Sash and Saber and available from this website. Army of the Meuse. Morning State June 11th 1745. Commander in Chief Armand De Rochefort Duc de Brie +2 The Cavalry. Regt Royal Eccossais mv2 24 figs 480men.